Going to See “Spamilton” for the 3rd Time! All twitter because I’m going to see one of my favorite shows in New York, the hilarious spoof of “Hamilton”, “Spamiliton” They’ve just moved from the Triad uptown into the W.47th Theater, where “Forbidden Broadway” used to play all the time. It’s a small Off Broadway proscenium house this time, not a night-club and barely a block away from “Hamilton” If you can’t get ticekts to “Hamilton”, you CAN see “Spamilton” and have yourself a hilarious time! I guarantee it! 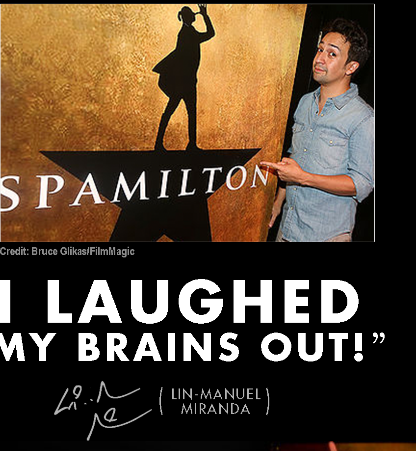 Even Lin-Manuel Miranda like it, too! See Above! He’s come at least twice. I’m told.